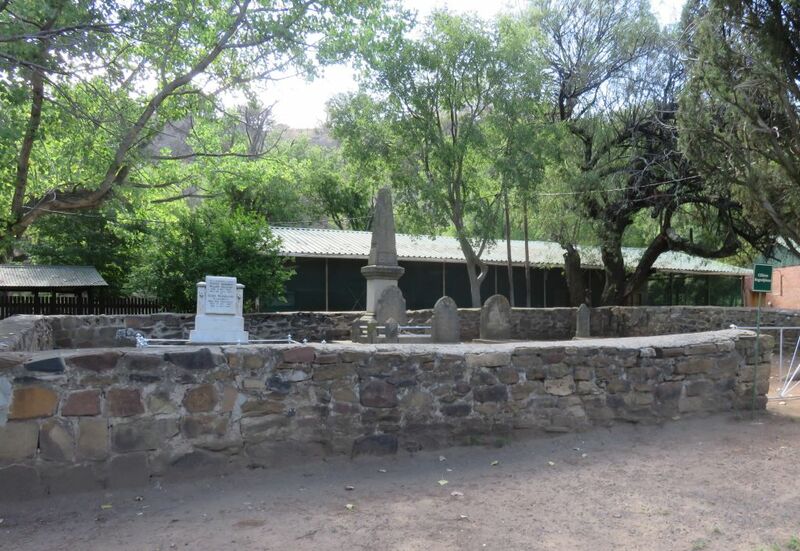 A historical place, the farm used to belong to Sarel Cillier, one of the prominent persons of the Great Trek. 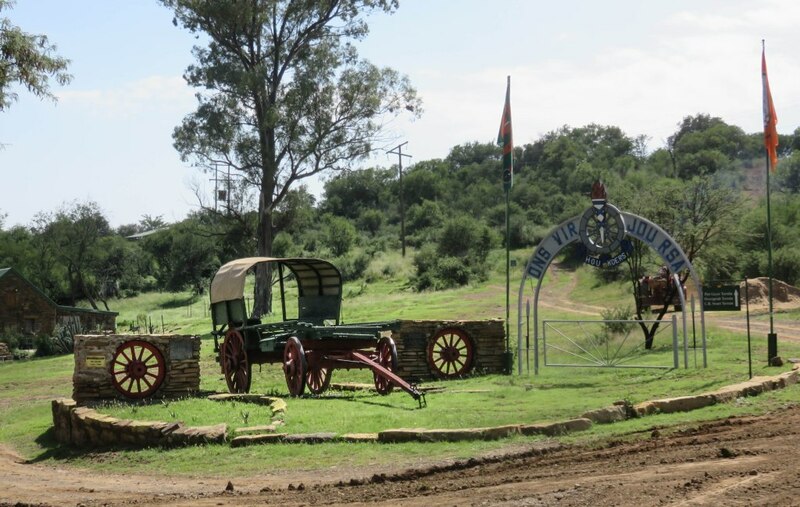 The farm now is the property of the Voortrekker movement, that is a youth organisation, in a way the Afrikaans equivalent of the boy scouts. The geo-position: 27.7267°S, 27.699°E and 1500m altitude. 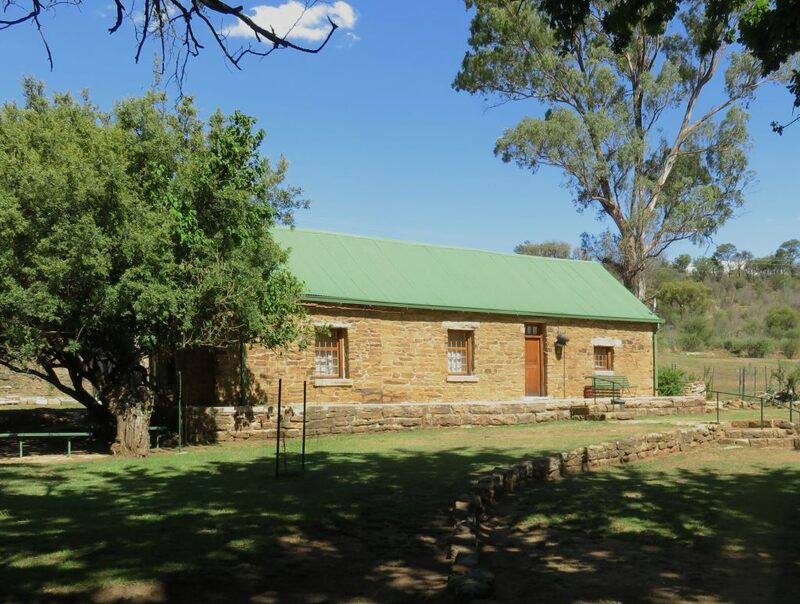 The present use of the farm is as a camp for the Voortrekkers, there is enough accommodation to take a few hundred guests. 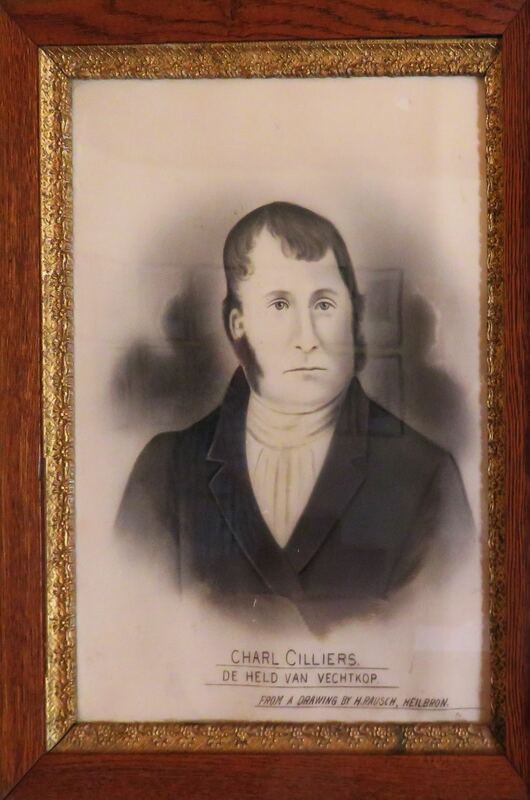 He was born in 1801 and christened as Charl Arnoldus, I am not sure how this became Sarel. He grew up on a farm near Graaf Reinet and never received any formal schooling but still became the spiritual leader of the Voortrekkers. Not an ordained minister he was leading the trekkers in worship and is best known as the author of the Vow, that was the vow made to God before the battle of blood river. This where the public holiday of the 16 December originated from, in the old days celebrated as the day of the vow and now Day of Reconciliation. He took up a farm near Pietermaritzburg, but when the British took over he moved to the farm Doornkloof in the Free State. Whilst still in Natal he was told about this farm, that it was for sale. He instructed his agent to purchase it for £15 and three head of cattle and moved to the farm in 1847. The house shown left and right is the second house he built. On the left the way it looked as restored after the Boer War, and on the left as at present, it lost the veranda. Across from the house is the museum, it used to be a stable. Exhibits are mainly from the 19th century and the beginning of the 20th. There are three graveyards on the property that I know of. 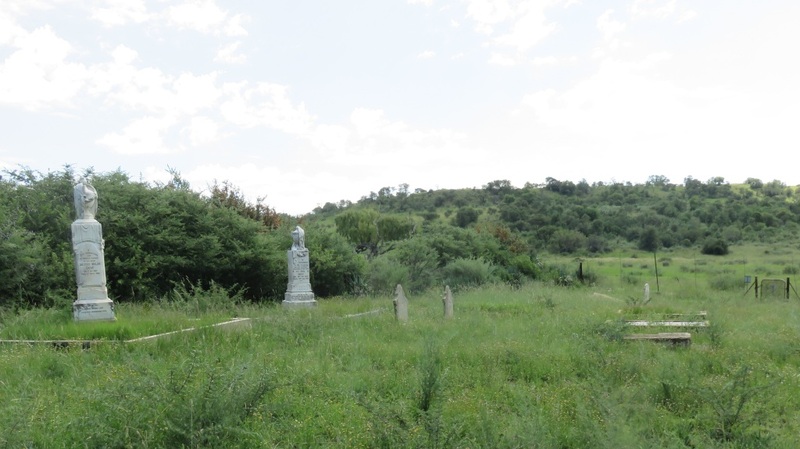 The, what I call, main cemetery is on Doornkloof, an other one is the graveyard of the Voortrekker movement and thirdly there is the graveyard on Doornkloofopstal, which is on the neighbouring farm. "Like grass is our brief life. Like a flower, standing erect in the veld and looking graceful, but powerless and fragile. When the wind blows over the land her stem breaks, her beauty is lost. One knows not and cannot find her position anymore. The dead speaks and says: what you are now, was I before. What I am now, will you become. By the power of God and his omnipotence am I now ....(unreadable)... turned into dust." Thanks to Frans Bolder for the translation. Is there a reader who could fill in the missing words? 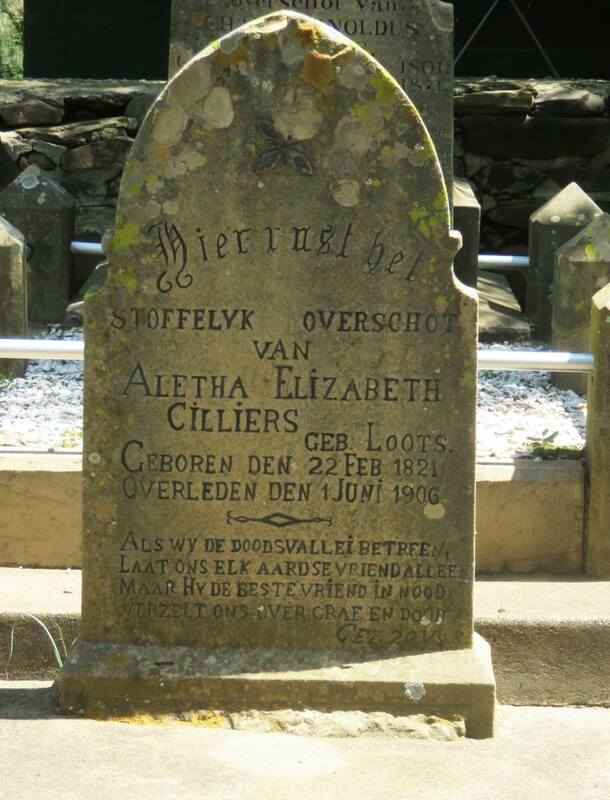 Hier rust het; stoffelyk overschot; van; Aletha Elizabeth; Cilliers; geb Loots; geboren den 22 Feb 1821; overleden den 1 Juni 1906. As we can calculate she reached a fair old age of 85, a notable age for those days when people in general lived to their 60th. 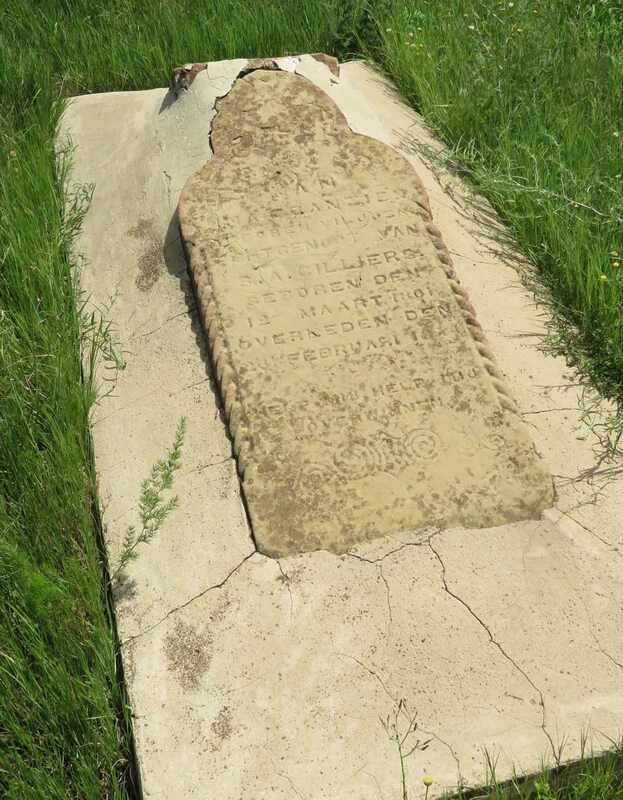 In the same grave yard is the only offspring he had with his second wife: Pieter Jacobus Willem Cilliers, 3-Oct-1857 to 26-Jan-1927 and his wife Elsie Magdalena Elizabeth born Schalkwyk, 17-Oct-1861 to 4-Sept-1905. 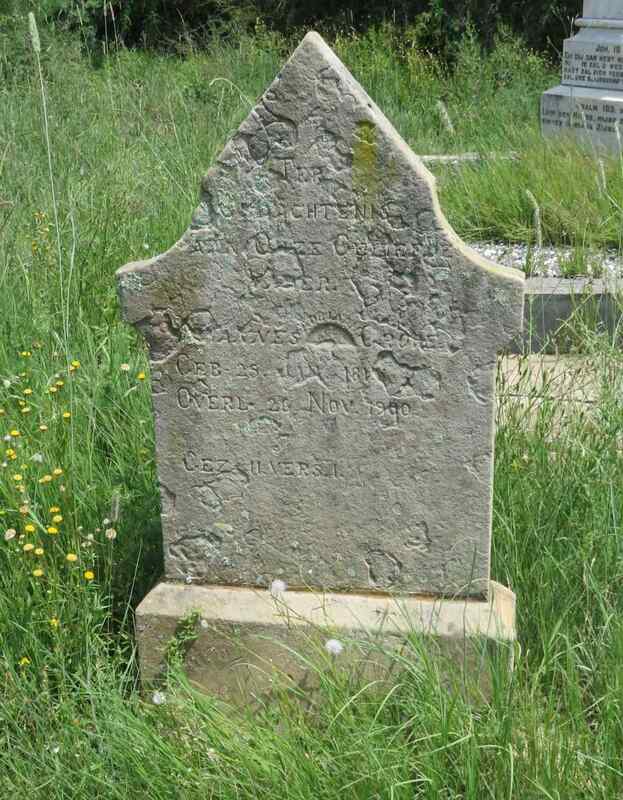 This graveyard is on the neighboring farm, it is near the entrance gate to Doornkloof. One of the boundaries is also the farm boundry, it is accessible from Doornkloof through a gate. 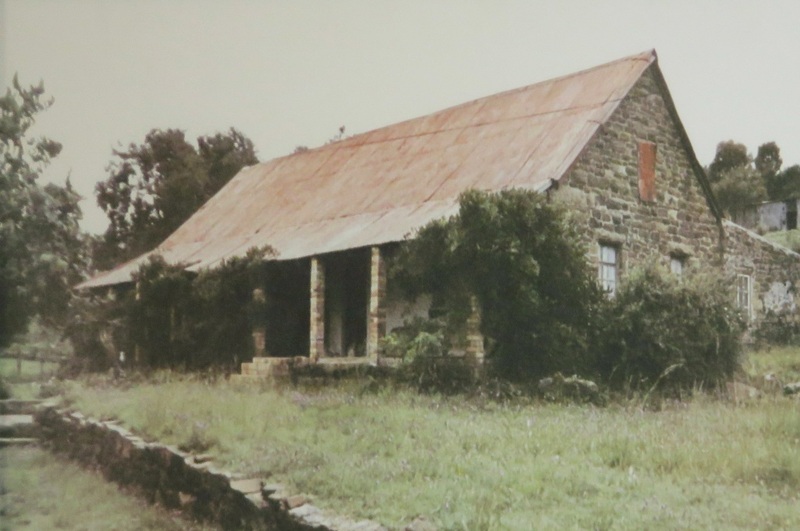 Doornkloofopstal is where Sarel Cillier initially lived after he had moved from Natal in 1847. Here he had built various structures, including a house and a church. 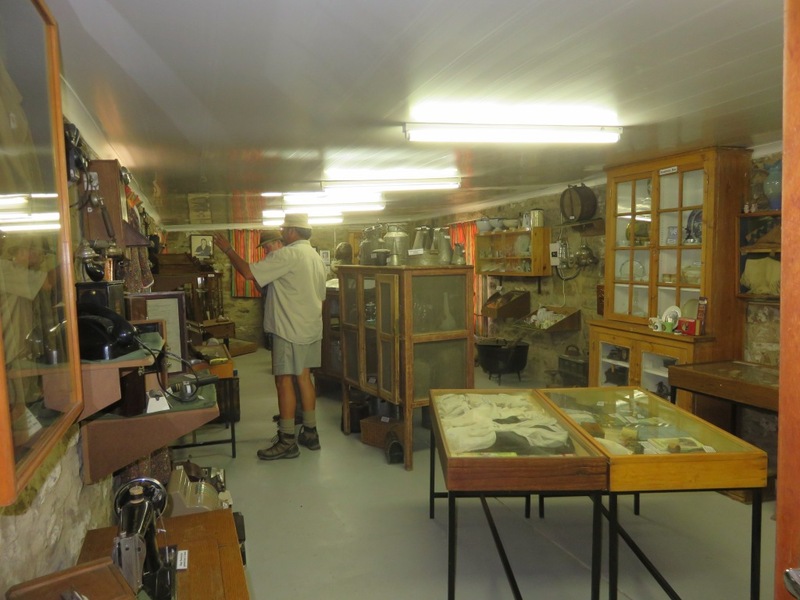 Soon after his arrival he bought the neighbouring farm for £75, which is the present Doornkloof. 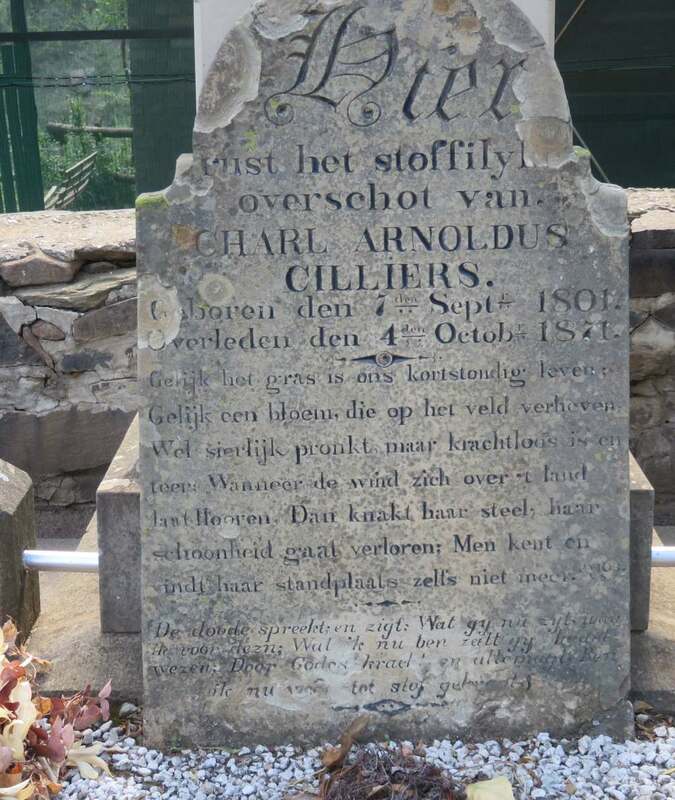 His first wife died on this farm and was burried there S.A.Cilliers; geboren den; 12 Maart 1801; Overleden den; 20 Februari 1851. I don't think it needs translation. Next to it is the gravestone of his wife. It states that here rests ??AR?? Maria ???? ?, Geb.Pretorius, Geb 30 Maart 181?, Overl 25 Mei 1907. 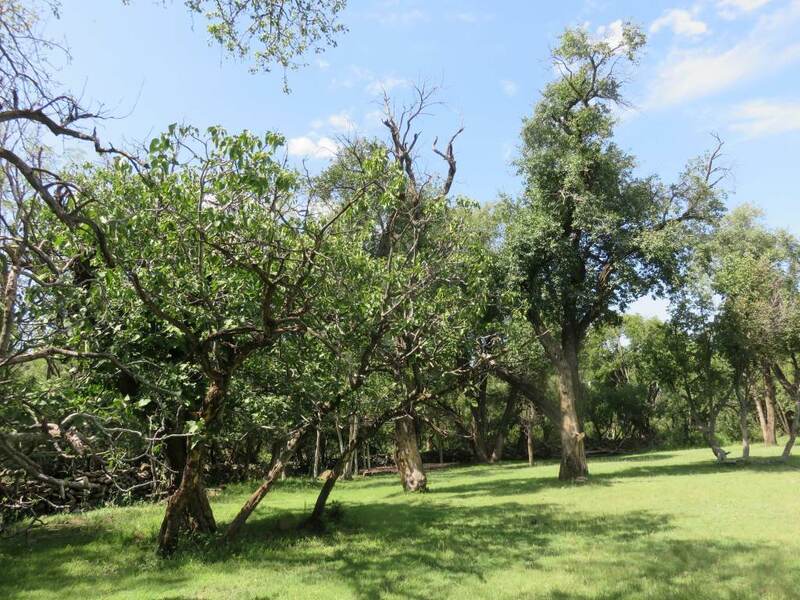 The garden originated from the times of Sarel Cilliers, some of the trees, at least, were planred by him. Thus they have been standing there and bearing fruit for 150 years plus. The fig tree was hit by lightning and split, the pieces still carried on and even today, as I have seen myself during a recent visit, are still carrying fruit. Other fruit tree species that I can identify are: pear, peach, plum, mulberry and apple. The area is enclosed by a wall of natural stones stacked up. This was to keep the animals away from the vegetables and fruit trees. 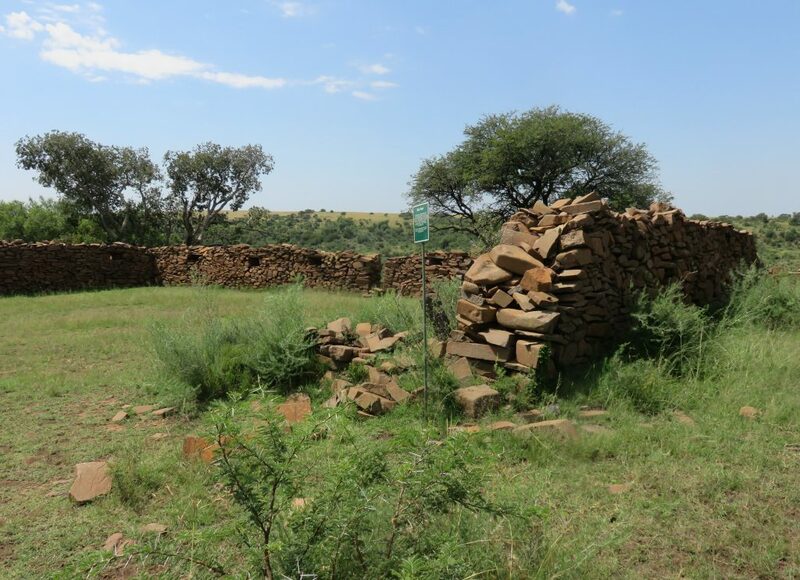 The picture shows the fort built by Sarel Cilliers as defense against the Basutos, who were a threat at the time. Building was done 1862/63. It has only three walls, the back toward the high flat area behind it was left open. The idea was that the enemy would attack coming up from the kloof and face the walls. The open side of the fort would be protected by pulling in and securing some wagons. The fort was never used. We are in a horrible situation which came about because of a mighty enemy. I and my wife were with my son Sarel when the Basuto attacked with a large force on the 22nd of June. It lasted from 9:30 in the morning until after midday, we were in a fight for over 2 hours I also used my gun, in total we were 7 fighting men our wives had to cast bullets for us. With us we had H. Prinslo and two Mosterds with their wives who also happened to be with Sarel. Prinslo lost some of his sheep, Dirk managed to retain the sheep and some dairy calves the rest was driven away by the Basutos. I would estimate that it was 900 to 1000 Basutos that encircled us, but they kept their distance so that they were out of reach of our weapons. Thank the Lord not one of us came to any harm, on the site of the Basuto we killed two and two were badly wounded, two of their horses died, we managed to capture three of the horses. how he was killed, I am unable to come up with a sensible translation, here is the original text, perhaps some reader can help: is aan sijn moeder wreed vermoord zij moes hem uijt trekke hij heef eers sijn leve vrij gekogd toen is hij vermoord). The wagon of J.Beukes with a kar tied to it was taken away, he claims that he had £220 in money on the wagon which is now lost. There are 54 wagons without oxen. That way the people are ruined. I retained 200 sheep, 2 horses and 10 dairy calves. There are also houses burned, I know of 9 farms where this has happened. There are many people who have nothing to eat. There were also attacks in Smithfield, 12 men have fallen and in Bloemfontein was one attack. But there the Basutos lost 120 men, on our side only one horse was killed. You can see what our condition is and I would like all of us who are afraid of the Lord to pray for us and to ask the great God to show mercy and not to allow us to be destroyed by our enemy or to succumb to starvation. We surely deserve this for our sins. I am now with my family in Kroonstad. We expect help to come from over the Vaal, 60 men have already arrived and, I think, on our side, we already have 2000 men in the Commando camps. We hear that there has been another attack, two house helps (I am not sure about this, the word is huijshouwe) have been murdered, at G.Beukes and Kowes. Note from the translator: I cannot claim this to be a 100% accurate translation. I had lots of difficulties with it. Some of the words I could not find in any dictionary, even when I changed the spelling to modern Dutch. A problem could also have come from his handwritten letters when transcribed into type. And then there is the problem of absolutely no punctuation marks, no beginning or end of a sentence. One has to remember he had no formal schooling, his writing skills were self-taught. I was told that these are the best preserved Leghoya huts. 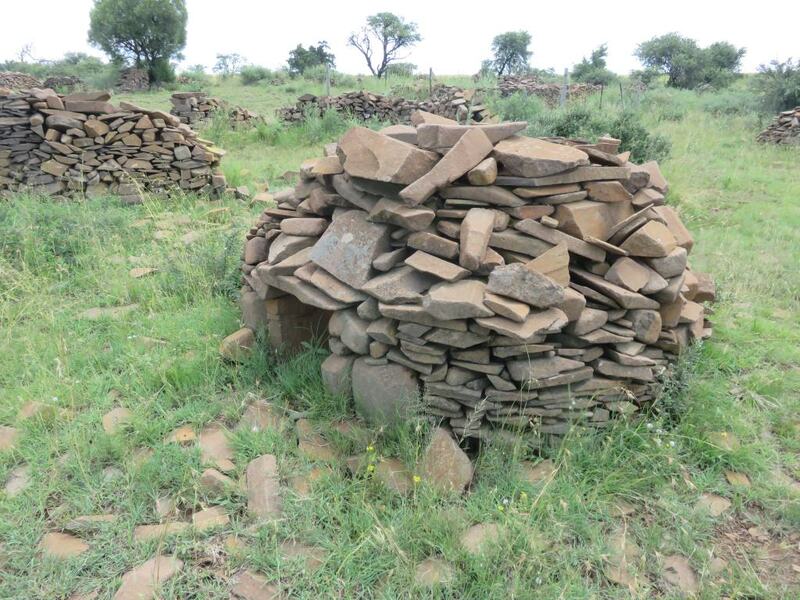 All the other places I have seen, none of the huts still have their stone dome, they have all collapsed. Here we have a few huts that are still intact.